Chromatic aberration cannot be fully disabled in-game. See Chromatic aberration for a workaround. Use Cuphead 3D Vision Fix. Disabling in-game Vsync caps the frame rate at 60 FPS. Open Assembly-CSharp.dll with a hex editor such as HxD. Change every instance of 39 8E E3 3F to 60 E5 18 40. Assets render in 16:9 aspect ratio so you'll get black bars on boss stages and tutorial. 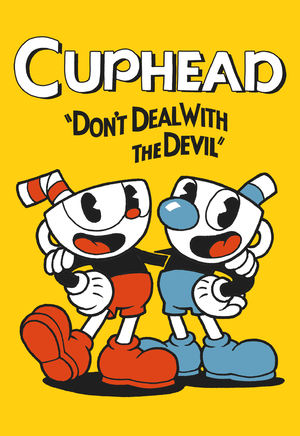 Download Cuphead 3D Vision Fix. Extract the fix to the installation folder. Change x3=0 to x3=1 under the [Constants] section. 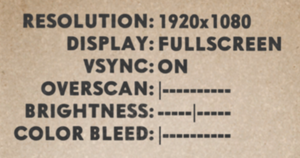 The color bleed option in the menu only increases/decreases chromatic aberration, but does not fully disable it. Change z3=0 to z3=1 under the [Constants] section. Change y3=0 to y3=1 under the [Constants] section. Mouse is not supported at all. Controller has to be assigned in the control settings, otherwise co-op mode is enabled. Install Special K by following the Unofficial Special K Guide. Expand the Direct3D 11 Settings → Texture Management section. Turn on Ignore Textures Without Mipmaps. Restart the game to apply changes. Expand the Window Management → Input/Output Behavior section. Turn on Mute Game under Background Behavior. 9, 11 DX9 is only supported in the "legacy- 1.1.5 DX9" build, available from the "Betas" tab in the Steam client. It will not receive further updates/DLC. Removes the flashing effect from the Run 'n Gun and Wallop text. 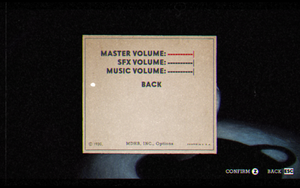 Filters such as the black-and-white and vintage modes can be unlocked manually. Go to the save game data location. Locate the file for your save slot and open it with a text editor. Edit the following parameters from false to true to unlock them. 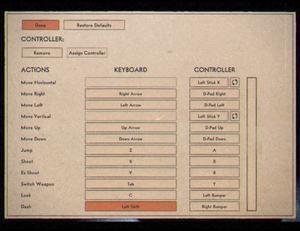 Load your in-game save slot and enable the new modes in the options menu. Expert difficulty can be unlocked from the start without completing the game first. Simple DebugInfo - Adds a debug GUI, HP bar for bosses, quick restart, camera zoom, and more. Simple Boss HP Bars - Displays an HP bar for bosses when playing the boss stages. Cuphead/Mugman Color Correction - Changes all the discolored glove/shoes for Cuphead/Mugman to be the correct colors. Debug Console Enabler - Enables the game's debug console, allowing access to a wide variety of features such as viewing scenes from the game, a level select, invincibility and more. SmoothParry (Steam only) - Removes the time-freeze that normally happens when you parry an object or enemy. This small change makes the game feel much smoother, especially in co-op. ↑ 3.0 3.1 File/folder structure within this directory reflects the path(s) listed for Windows and/or Steam game data (use Wine regedit to access Windows registry paths). Games with Steam Cloud support may store data in ~/.steam/steam/userdata/<user-id>/268910/ in addition to or instead of this directory. The app ID (268910) may differ in some cases. Treat backslashes as forward slashes. See the glossary page for details. This page was last edited on 20 April 2019, at 09:22.